EAST RUTHERFORD, New Jersey -- The New York Giants are turning their rebuilding process over to an old hand who believes in old-time football. The Giants (2-13) hired former Carolina executive Dave Gettleman as their general manager on Thursday, bringing back a 66-year-old who spent 15 seasons with the franchise before going to the Panthers and helping them get to the Super Bowl in 2015. Gettleman, who helped the Giants build strong offensive and defensive lines in his tenure, will be introduced at a news conference Friday. "Given where we are as a team, we thought it was important to bring in someone with experience as a general manager and a proven track record," co-owners John Mara and Steve Tisch said in a statement. "Dave's experience is unparalleled. He did an outstanding job as general manager in Carolina, and he was vital to our success during his tenure here. Dave is going to bring his own approach to our organization in how we draft and acquire players through free agency." 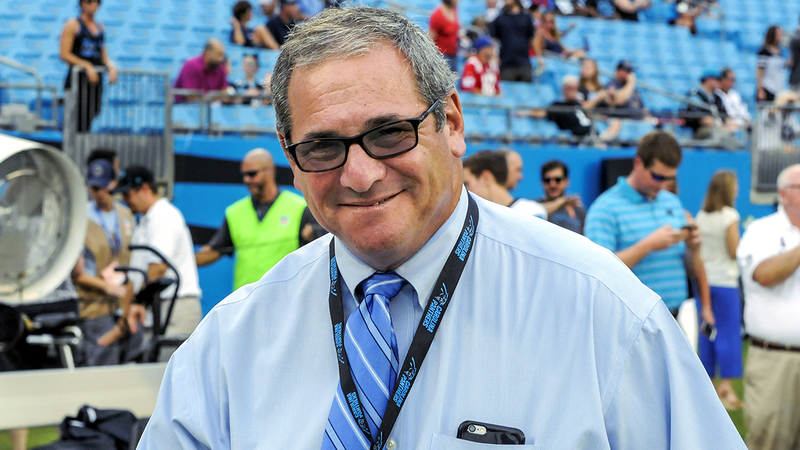 Gettleman was Carolina's general manager from 2013-2016. He was fired after the team missed the playoffs following their Super Bowl appearance. He upset some fans with his player moves, cutting receiver Steve Smith before the 2014 season and running back DeAngelo Williams in 2015, then allowing cornerback Josh Norman to become a free agent in 2016 after rescinding the franchise tag. Norman signed with Washington, coincidently the Giants opponent this week. Gettleman will be the Giants' fourth general manager since 1979, following George Young, Ernie Accorsi and Jerry Reese, who held the job for 11 seasons before he was dismissed on Dec. 4 along with coach Ben McAdoo. Gettleman's first job will be to hire a coach. Interim coach and defensive coordinator Steve Spagnuolo, who replaced McAdoo, has been promised an interview. It would not be surprising for him to interview Panthers defensive coordinator Steve Wilks, whose unit has played a big part in helping Carolina (11-4) fight for the NFC South title with New Orleans heading into the final week of the regular season. The Giants interviewed four men for the job: interim general manager Kevin Abrams, the assistant G.M. for 16 years; Giants vice president of player evaluation Marc Ross; and former NFL personnel executive and current ESPN analyst Louis Riddick. Gettleman interviewed on Dec. 20 with Mara, Tisch and former general manager Ernie Accorsi, who consulted in the hiring process. Gettleman originally joined the Giants in the spring of 1998 as then-pro personnel director Tim Rooney's assistant. He was promoted to pro personnel director the following year upon Rooney's retirement. Gettleman stayed in the position 13 years, traveling to scout the Giants' upcoming opponents and gathering information on every NFL player. He became the team's senior pro personnel analyst in 2012 and went to the Panthers the following season. In his four seasons, Carolina was 40-23-1 and won three consecutive NFC South titles. In 2015, Gettleman was chosen The Sporting News' NFL Executive of the Year after the Panthers finished an NFL-best 15-1 record and advanced to Super Bowl 50. Gettleman has been a part of seven Super Bowl teams, including three winners. He was with Buffalo in 1990 and 1991; Denver in 1997; the Giants in 2000, 2007 and 2011; and the Panthers in 2015. The Broncos and the 2007 and 2011 Giants won the championship. Gettleman has been associated with 16 playoff teams in his 30-year NFL career.